If you’re cruising to Bermuda odds on you’ll arrive at Royal Naval Dockyard (Kings Wharf/Heritage Wharf). After leaving your ship, the Bone Fish Bar and Grill is the first restaurant you’ll come to. The menu features fresh seafood, Italian dishes, salads, steaks, and burgers. Prices are reasonable for Bermuda. For an appetizer at dinner try the Trio Mare (smoked salmon, fried calamari and shrimps) or the Nachos Platter (bolognaise beef ragout, melted cheddar, spicy chilli, guacamole, and sour cream). Tempting entrees include Sapore Di Mare (spaghetti tossed with seafood and shellfish) and Fish Bermuda Style (catch of the day, pan fried with a Gosling’s Black Seal Rum sauce, topped with Bermuda bananas and roasted almonds). Live entertainment is provided throughout the summer months. Mondays evenings sees Salsa Mania. Dancers from the Sabor Dance School, the island’s main Latin dance school, put on an impressive performance and offer tuition to customers. Karaoke Night is every Wednesday and on Thursday evenings there’s a DJ until midnight. On Sunday afternoons listen to Randy Lambert play Spanish guitar. It’s also a pretty good place to come for drinks. Beers on draught include Boddingtons and Stella Artois. They also serve a wide range of bottled beers, martinis, speciality cocktails, shooters, champagne, plus wines by the glass and bottle. Order a large beer or speciality cocktail and you’ll receive a souvenir glass to take home. The Bone Fish Bar and Grill is open 7 days a week from 11.30 am until late. Lunch is served between 11.30 and 5 pm, and dinner from 6 pm until 10.30 pm. 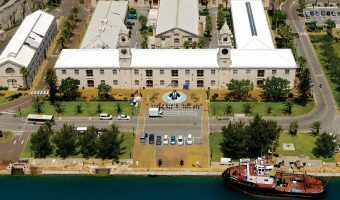 The restaurant is located at Royal Naval Dockyard, right next to the ferry terminal and bus stops. It’s owned and managed by Italian chef Livio Ferigo. If you’ve been coming to Bermuda for a long time you may remember him from his days at the Monte Carlo and Mediterraneo restaurants in Hamilton (both now closed). He currently also owns Café Amici at the Clocktower Mall. Map showing location of Bone Fish Bar and Grill.